Israel’s attorney general says he is considering charging Prime Minister Ehud Olmert with corruption over allegations he illegally received funds from an American businessmen. Attorney General Menachem Mazuz says Olmert committed fraud and breached confidences when he allegedly used his then-position as mayor of Jerusalem to help businessman Morris Talansky in 2006. Olmert says the money he received was legal campaign funding. Mazuz will decide whether to indict Olmert after the prime minister has had a chance to refute the charges in a hearing before the attorney general. No date has been set for that meeting. Mazuz ordered an investigation in April 2008 into the relationship between Olmert and Talansky. Talansky gave a colorful testimony last year, telling of various times that he handed Olmert envelopes stuffed with cash. 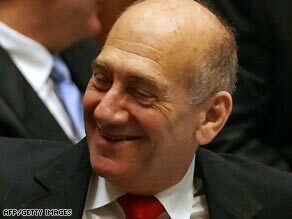 The testimony badly damaged the already unpopular Olmert. Israeli police recommended in September that Olmert be charged with corruption over the Talansky case and the “Rishon Tours affair,” in which Olmert was accused of pocketing money for official travels. A hearing in the Rishon Tours case is set for April. Olmert announced days after the police recommendation that he would resign as head of the Kadima party. Israelis went to the polls last month and Olmert is now caretaker prime minister until a new government is formed.